Every day, thousands of traders search for hundreds of binary options brokers online since binary trading turned out to be quite fast money-gaining business in the global market. So, it‘s no wonder it attracts so many traders to invest in this kind of business. Binary options bring high profits and fast returns with minimal risks. If you want to earn high level of profit and get many rewards for your investment, you must learn how to properly eliminate risks and uncertainties. Every trader must keep these 2 goals in mind: to get high profits and maintain a deposit. 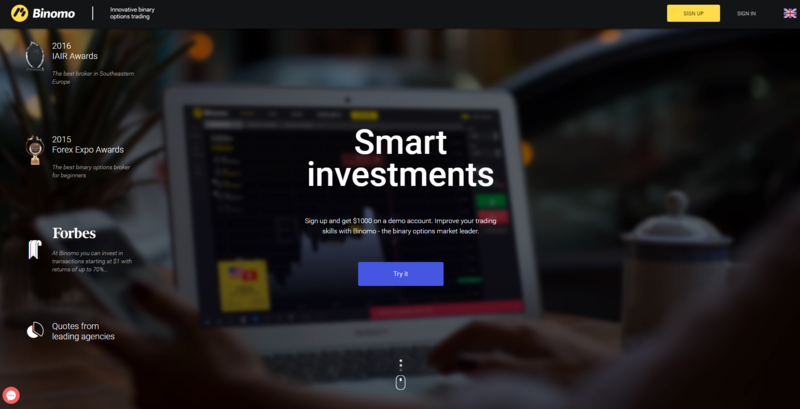 Binomo trading platform offers reasonable trading options that promise to be beneficial for both experienced and newbies in binary options trade. Check out their affordable conditions and a considerable range of support services for professional training, customer support, and analytics. Binomo appeared on the market in 2014. and was established by Stagord Resources Ltd, registered in Nicosia, Cyprus. It is generally considered a safe broker providing fair trading services and analytics. Besides having a full set of technical tools necessary for efficient trading, it allows simple and fast withdrawal which seems to be one of the platform‘s great advantages. However, be aware that they have a pending application at CySEC and CPO regulation, which means that they might not be a LEGIT broker. When you pick a broker, always check their regulation status. Binomo is constantly updating and expanding the list of assets, and it has more than 50 types of assets available – currency pairs, stocks, metals, commodities. When you log into your account you’ll see an asset that has increased, which gives you an opportunity to make a profit from every trade you make on the particular asset. The assets offered are directly related to the market economy and they reflect the current market condition. But still, traders must be smart in making their final decisions. 1. Demo account – requires no investment, and it‘s an effective way to test your strategies and trading process for free. 2. Standard account – requires a deposit of $10. With the minimum amount, you‘re offered 85% return contracts, analytical support, and special offers. 3. Gold account – requires a deposit of $500 and with this amount you‘ll be able to reach 86% return contracts, bonus funds and 5 % refund of losses. 4. VIP account – the minimum deposit is 1000 USD and it allows you a full list of services – 90% return, 10% refund of losses, withdrawal of funds within 4 hours. The minimum deposit is 10 EUR/USD or 500 RUB, or you can register to demo account if you don’t want to pay any deposit. The maximum deposit amounts 10 000 EUR/USD or 200 000 RUB. Minimum withdrawal, however, is 10 EUR/USD or 500 RUB and can be made through QUIWI, Neteller, Yandex or your bank card if you want to wait 3-5 business days to withdraw your money. Binomo‘s brokerage service includes professional level tutorials, analytical services, and client support. You can reach their support team via Live Chat, by Email or Skype, and the supporting languages are English and Russian. As for the education section, they offer an extensive and detailed course on binary options for the newbies for free.